Winter is beautiful and magical but it has its own set of challenges, one of which is walking safely. It is not only hard to walk because of snow, but it may prove difficult to spot if there is ice or black ice on the road. Each year more than 50.000 people get injured because of ice. If you’ve fallen on ice and hurt yourself, you should contact your slip-and-fall injury lawyer in Maryland and file a claim to receive compensation. In the state of Maryland, there are some specific laws and precedents used to determine the fault for a slip-and-fall accident Maryland. Your slip-and-fall injury attorney from Maryland can explain to you more about the laws of your county or city, because in some areas the local government have issued their own rules in regard to clearing the snow. But, according to Maryland slip-and-fall law, if the victim can be attributed even the smallest amount of fault, they cannot collect any damages under the pure contributory negligence. Assumption of risk is related to pure contributory negligence, meaning that you voluntarily and willingly assumed a known risk. When ice is involved in a slip-and-fall accident, a special set of rulings and challenges come into play, especially when it involves both landlords and black ice. So, if you saw ice, slipped and injured yourself, you would be considered partially at fault and the case would get dismissed. But if black ice is involved, which cannot be seen and expected, then the case would be less likely to get dismissed and actually have great chances of winning slip-and-fall compensation in Maryland. 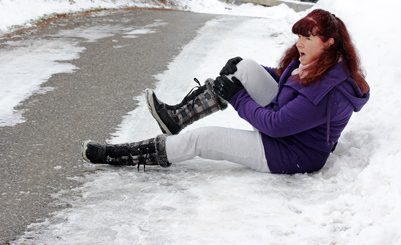 The precedent for slip-and-fall black ice accidents comes from 2011 when Maryland’s court stated that black ice cases are different than other type of slip-and-fall cases. The court’s decision came as no surprise, as a person who slips and gets injured cannot assume to know of the existence of black ice. Landlords and housing associations have a special set of circumstances regarding ice, and it depends on whose legal responsibility it was to melt the ice and clear the snow. The information for this can be found in the lease. If it is written in the lease that the landlord is responsible for removing ice and snow, then the landlord is liable for the slip-and-fall on ice if they didn’t do their job in a timely fashion according to the law. You can ask your lawyer about your lease and see who is liable for the accident. For more information about getting hurt on ice and filing a slip-and-fall injury claim you can contact the best injury attorney in Maryland for a free consultation of your case at (443) 569-3950 or send an email to [email protected].